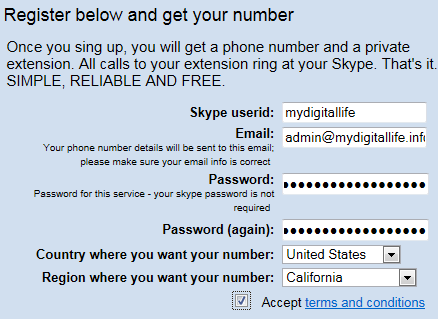 The Skype Online Number, previously known as SkypeIn, costs a hefty price tag of USD $6 a month. The SkypeIn Online Number is essential the virtual phone number of you on Skype service, just similar to your landline or mobile number. It allows callers to call a phone number which is diverted or forwarded to your Skype account automatically, and ring your Skype client on PC, Macintosh, iPhone or other mobile devices. As Skype Online Number is not free, so it’s not possible to register multiple virtual phone numbers of Skype so that callers can call a local phone number at local calling rates instead of having to dial a long-distance or even international calls. 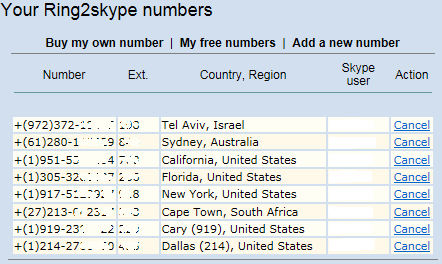 Even if you decide to pay, Skype-in Online Number only offers phone numbers in around 25 countries. Skype users who want a inbound phone number but don’t want to pay a premium for the service can use Ring2Skype instead. Ring2Skype is a service that allows you to have a local phone number in more than 100 cities around the world, and answer calls to those numbers in Skype for free, regardless of your actual location. To get the free Skype online phone number, just sign up and register at http://www.ring2skype.com/. But firstly, you will need a Skype account, as Skype user ID is required for registration. Signing up is so simple that it can be done in less than 1 minute and you will have instant access to your alternative Online Number. No credit card information and no software download are required. Note that Skype password is not required, and don’t use the same password for Skype and Ring2Skype to protect your privacy. Currently, Ring2Skype offers a phone number with a private 3-digit extension that is dedicated to you, and that will be directed to your Skype account. In fact, the usage of extension where you have to call the number and dial the extension after the call is connection is the only annoyance of Ring2Skype otherwise reliable yet free service. The audio quality of the Ring2Skype has been on par with most VoIP calls too, if you manage to call into the number provided. As it’s free, some downtime is expected, but it’s recommended that you actually test the phone number given to you can be connected to before giving it out. If the number doesn’t work, just create and get a new number in different locality. More than one free numbers can be registered, allowing you to provide local inbound Skype number to people on many regions. The local phone numbers are available in Argentina, Australia, Austria, Belgium, Canada, Chile, Cyprus, Czech Republic, Denmark, El Salvador, Estonia, Finland, Greece, Hungary, Ireland, Israel, Italy, Lithuania, Luxembourg, Mexico, Netherlands, Norway, Peru, Poland, Puerto Rico, Romania, Slovakia, South Africa, Spain, Sweden, Switzerland and United States.